Over the past few months, Google has been making Chrome OS more touch screen-friendly. The virtual keyboard has been tweaked, pull-to-refresh has been added, and the file manager works much better on touchscreens. 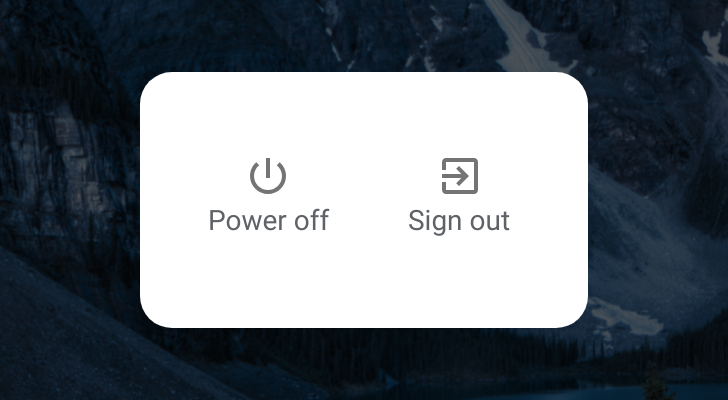 Another change has arrived in the Canary channel - a power menu that looks remarkably similar to Android's. Right now, holding down the power button for a few seconds just makes the screen fade to white and shut down (pressing power once locks the device). The new menu appears, "on Chromebooks with [a] touch screen," according to Chromium Evangelist François Beaufort. Unfortunately, there's no restart button, at least for now. It's great to see so much work being done to improve the touchscreen experience, especially since Chrome OS tablets (Chrometabs?) are just around the corner. The menu is currently live in the Canary channel.